This accessible textbook provides a clear and practical introduction to phonetics, the study of speech. Assuming no prior knowledge of the topic, it introduces students to the fundamental concepts in phonetic science, and equips them with the essential skills needed for recognizing, describing and transcribing a range of speech sounds. Numerous graded exercises enable students to put these skills into practice, and the sounds introduced are clearly illustrated with examples from a variety of English accents and other languages. As well as looking at traditional articulatory description, the book introduces acoustic and other instrumental techniques for analysing speech, and covers topics such as speech and writing, the nature of transcription, hearing and speech perception, linguistic universals, and the basic concepts of phonology. 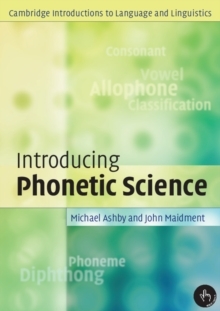 Providing a solid foundation in phonetics, Introducing Phonetic Science will be invaluable to all students beginning courses in linguistics, speech sciences, language pathology and language therapy. Further exercises will be available on an accompanying website.